When you buy a corporate kit(corporation kit, corporate book), LLC kits, other incorporation kits (NFP kit, Non profit kit, partnership kit) or individual corporate supplies and LLC supplies from CorpKit, you buy manufacturer direct, saving you time & money. 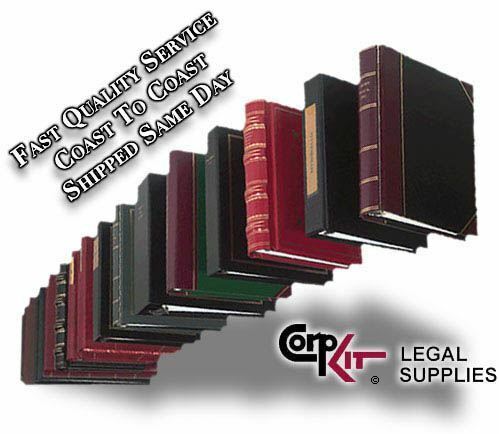 We specialize in corporate kits(corporation kits), copy protected stock certificates, LLC Certificate embossers corporate seal, corporate seals, notary embossing seals, corporate minute book and minute book binders & estate planning kits at CorpKit.com. You can purchase individual corporate supplies such as the do-it-yourself line of blank minute book binders, incorporation tabs & copy protected blank stock certificates. When you order any kits or Certificates, we provide PDF template to customize your certificates. Each custom corporate kit or custom LLC kit are available for all 50 States, including Florida Corporate Kit, Delaware Corporate Kit. All Corporate Kits include stock certificates (share certificates), embossing seal, minute book binder, corporate stock certificate transfer ledger, choice of plain minute book paper or corporate minutes and bylaws. For LLC kits, instead of including stock certificates (share certificates) and bylaws, we provide LLC member certificates and operating agreement. When you buy a kit from CorpKit you have 15 styles to choose from. Corpkit Legal Supplies is a leading manufacturer of corporate kits(corporation kits) giving our customers quality, savings & selection. When you buy a copy protection stock certificate from Corpkit, you have many options to choose from. There are custom stock certificates, blank stock certificates and standard wording stock certificates. We can provide certificates for all incorporations such as LLC membership certificates and LLC interest certificates, corporate stock certificates, non profit membership certificates or not for profit membership certificates and more. Ask for our free CD software when you purchase stock certificates. This Free Gift provides a stock certificate template which enables the user to issue each stock certificate. We have embossers for corporate seals, notary seals, military seals, engineering seals and library seals. We also have pre-inked stamps for corporate stamps, notary seals, notary stamps & business stamps. When shopping for a corporate seal don't forget to look at our new corporate seal combo, corpad corporate inking pad and custom gold notarial seals for embossers. Look at our full line of business stamps. Click Me! I will direct you to corresponding category. Higher Quality Products Direct from the Manufacturer. All genuine Corpkit Eagle or Standard certificates come with copy protection technology. When photocopied, the word "COPY" will be printed across the page. They come as a standard in our corporate/LLC kit line at no additional charge. *This excludes our Hot Buy items. Custom Corporate Kits, LLC Kits, Partnership Kits, Not-for Profit Kits. Stock Certificates, Membership Certificates, Partnership Certificates & Public Issue Certificates also Available. Corporate Seals, Notary Seals, Notary Supplies, Rubber Stamps. Kits have 15 Styles to choose from, All Kits are available for all 50 States. Do-it-yourself line lets you Customize your Kits and Minute Books. 45 states specific By-Laws And Operating Agreements. Our new and improved Slim Line corporate kit allows you to organize and protect all your important company information. This is a 1" Binder (angle D) with a fold over flap to safely secure your documents inside. It contains an inside pocket to hold important documents. The Slim Line binder comes customized with the company name on thick-stock gold paper, inserted in the holder on spine of the binder. This also makes the binder reusable for name changes or other things. It comes complete with a customized Portfolio Style Vinyl binder, 10 customized top stub certificates, 20 customized peel and stick gold wafer seals, 6/7 index divider tabs (depends on type of formation), 25 sheets of blank minute paper. It is available in Black only. This customized kit does NOT come with a slipcase. ThriftKit Corporate Kit Our most popular Kit. Vinyl 3 locking "D" ring and Matching Slipcase. Handy label holder on the spine for a gold leaf insert with the Corporate Name imprinted on it. Inside cover has a pocket to hold additional important papers. Hand embossing seal with Company's information on it. Seal comes in a seal pouch for storage and protection when not in use. Available Colors: Black with Gold, Black with Silver, Blue with gold, Blue with silver, Burgundy, Green, Burgundy&Black. America's most innovative corporate kit company!! !